Even though the Real Housewives franchise has been going strong since 2006, there still hasn’t been a gay full-time cast member. That is so shocking for many reasons. It felt like that could have been a possibility on Real Housewives of New Jersey when Rosie Pierri was making her regular cameo appearances. Everyone loved Rosie. She brought heart and humor to the show. She even had an organic connection to the cast. Why wasn’t she promoted to a full-time cast member? That was a definite misstep. During Season 7 of Real Housewives of New Jersey, Robyn Levy and her wife made occasional appearances. We never got to know her very well, but she was close with the cast members during that time period, so why didn’t she get more screen time? All of the full-time cast members have been straight women. Erika Jayne, an avid LGBTQ advocate, thinks it is time for a change. I couldn’t agree more. As Kathy Wakile once said, Real Housewives of New Jersey really is “the Teresa show.” RHONJ historians recall that Teresa Giudice’s cousin declared that during a reunion episode argument and she didn’t mean it in a flattering way, but the quote still stands. Teresa Giudice is Real Housewives of New Jersey. Real Housewives of New Jersey is Teresa Giudice. They even delayed filming seven months to wait for Teresa to come home from prison. Hell, they had a three-part episode where Teresa talked to her family via speaker phone. That’s right: SPEAKER PHONE. Teresa was able to carry this show via phone call, so of course anyone with eyes and ears knows that she is THE queen of the show. Like her or not, she has been and will always be the center piece of this show. With that said, everyone on the show does what they can to be in her good graces, so it’s interesting to know what Teresa thinks of all of her potential soldiers costars. 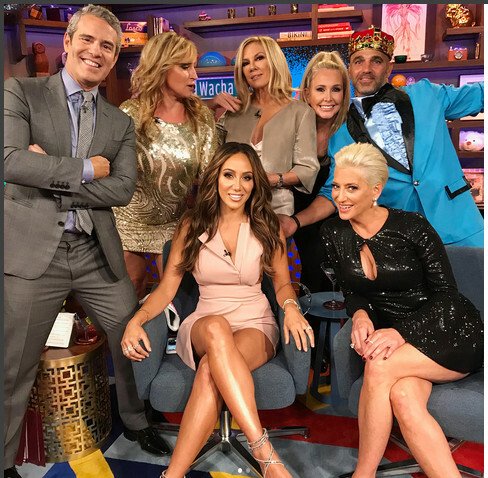 After such a much-needed Real Housewives of New Jersey comeback, I figured that Melissa Gorga would be spilling the tea during her Watch What Happens Live appearance. Unfortunately, that was all superseded by the Real Housewives Awards. I don’t know why this was all squeezed into one episode, but it was. Don’t get me wrong, Dorinda Medley was there the whole time, so there were some hilarious moments and special appearances, but it just felt like it should have been two separate shows to me. With another season of The Real Housewives of New Jersey under our belt, it’s time to reflect on the season 7 and look ahead to season 8. Share your opinions on this year’s new additions to the cast, what you hope for season 8’s cast and so much more in our new poll roundup! Last night was the pre-finale for Real Housewives Of New Jersey. Since Jacqueline Laurita had laryngitis, she let Milinia do all the talking for her. Finally because at least Milania’s outbursts make a lot more sense! A silent Jacq is still deadly though… thank be the powers of the smart phone put into dumb hands. Oh that Milania, I don’t care – I love her. Teresa Giudice acknowledges that Milania is not adjusting well to Juicy being “away.” And why should she? On Juicy’s first day in the slammer, Joe, Melissa Gorga, and the kids come over with sprinkle cookies Chinese food to check in on Teresa and the girls. They find Milania mouthing off all kinds of projecting, and Teresa is in a tailspin. I would not say Teresa Giudice is qualified to accuse anyone of ruining her family’s reputation, but nobody ever found her guilty of logic. With her newfound love and light, Teresa accuses Kathy Wakile and Rosie Pierri of trying to keep the family drama alive because “it’s about the money and it’s all about the fame” for them.